Visiting Gatlinburg Tn? Don't miss Keith's amazing show! One of England's funniest comedy acts is now in the USA! Read the customer reviews below! Amazing observational comedy, hilarious prop comedy, riotous audience participation, magic that makes you laugh as you are being fooled! Need convincing? Watch the video clips! Email me and I will tell you more! Corporate events, church groups, comedy clubs, private parties... Whatever the event, we guarantee a night you won't forget in a hurry. Comedy which is always totally appropriate for your audience. Clean, family friendly, amazing and very funny. And it all comes with our unique guarantee - if your audience do not enjoy the show you do not pay a penny! Adults & Kids had a blast!!! We saw this show at Dickens Parlour in Bethany, Delaware. Keith was phenomenal. He had our grandchildren And us in stiches. I am talking belly-laughs here. The magic and humor were world class. Don't miss this show if you get a chance. Thanks for coming to the show and we are soooo glad that you had a great time (we did too!). It is always a pleasure to perform at the Dickens Parlor Theater, it is one of our favorite venues. Thanks for taking the time to give us a review. OH MY WORD!! I cannot believe how much fun each and every one of our staff had at this year's Holiday Event. Thank you so much Mr. Fields for making this year's office party such a huge, wonderful and HILARIOUS experience. Probably the BEST event we have had....EVER!!
" A Brit of Humor "
Keith was great and well received by our audience of physicians and their spouses. 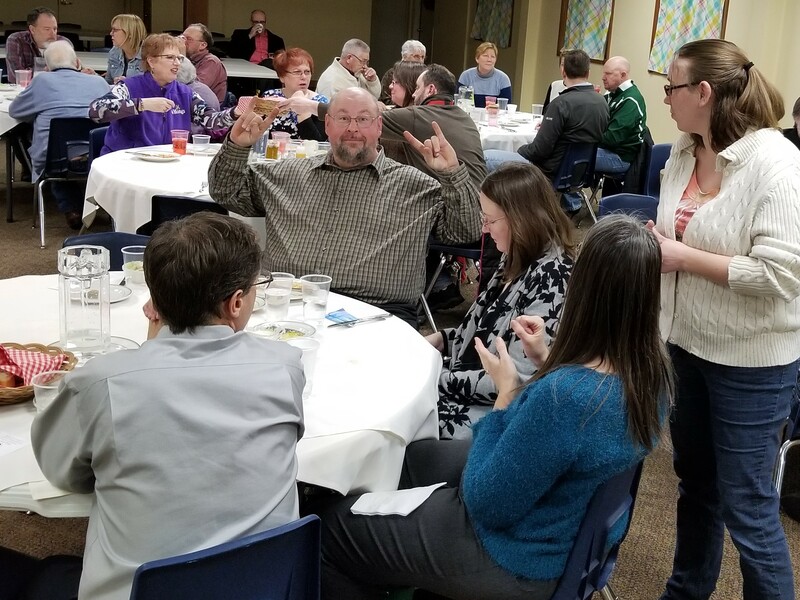 He was able to be humorous while at the same time delivering the underlying message of coping with and/or accepting changes that come into our lives. Thanks for your kind review, June. Your group were great fun and made my job easy😃. Mr. Fields was hilarious and family friendly. We so needed to laugh and he did not disappoint us. It was a fantastic evening! Now it's back to work in our cubicles! Thanks for the review Erica. It was so great to be a part of your fundraiser. Glad you enjoyed the show. I know I did! Keith did a great job in a room way too large for our planned turnout and crowd that didn't want to participate. By the end of the show he had everyone laughing and enjoying the event. 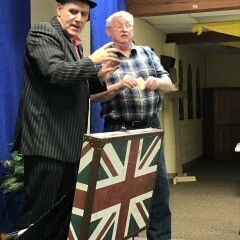 Keith did a great job, funny and great magic we recevied lots of good feedback on how much everyone enjoyed the event. Keith keeps up the "British End" with his comedy. Keith gave a great show. It fit our venue perfectly and the coordinating was flawless. My team enjoyed his energy and overall style. we would certainly recommend any group interested in something different to consider what Keith can bring to the table. Also Sarah's coordination was superb and she traveled to the show to make sure all went well, an added value. We submitted a more detailed review on Monday, December 5th. Keith's performance was all that we expected and more. While I believe Keith had everyone engaged, the audience response was somewhat reserved, which I have experienced previously in our area. However, from comments overheard after the show, I know everyone enjoyed themselves. We will all forever try to determine how the $100 bill made its way into a lime in a stapled shut paper bag. Simply wonderful!!! Keith entertained our group at our year end meeting and did a fantastic job. I had so many employees tell me how they thoroughly enjoyed his humor, magic and helpful messages. I would encourage anyone to book him for an event. Thank you for the review and thank you for asking me to speak at your event. The people at your company were a wonderful audience, I think I enjoyed the show as much as they did. Keith was beyond Amazing! I would defiantly recommend him for any party looking for a entertainer! He's a very funny guy with a great personality! A Brit Comes to Novi! Thanks Keith for playing to our audience in a respectful and funny way. 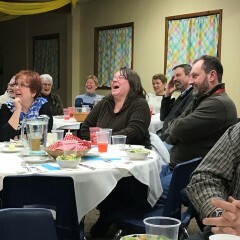 Our retirees loved you and it was so nice to laugh together. Sitting down and laughing and being entertained is my favorite way to relax. I also appreciate you taking credit card. Plastic is a beautiful thing. Have a great year! The Brit offers you more than just wit!! If you are looking for entertainment that is just a bit spicy and a whole lot of fun Keith is your guy. His ability to engage the audience with his quick wit and magic only added to the success of our evening. 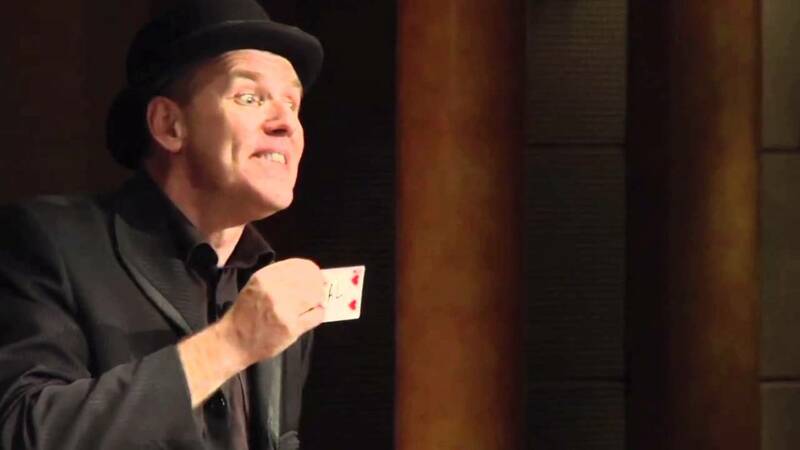 You will not be disappointed if you book this act. Thank you so much for your review, it really was a pleasure to perform for you and I was so excited about the amazing amount of money that was raised for the animal shelter. Wow! A great night for everybody. Hope we can work together again soon. I hired Keith to perform at a surprise 50th birthday party. He traveled a long way for this event. Communication and planning were great. Timing was perfect. He was a complete professional, and gave us a very fun show. We are still shaking our heads trying to puzzle how he could have done some of those magic tricks. He is genuine and naturally does one of the things I love most in a showman, laughs right along with us. Keith was a hit at our employee Christmas Party. He was hilarious and kept the entire audience engaged. We received many compliments following the show and would definitely have him back again. Hilarious entertainment for a professional event. Keith was professional, punctual, and most important...funny! The audience was engaged and only wished we had booked him longer. The booking was very easy, Sarah promptly answered our requests and all of our questions. Keith called a few days before the event to finalize our evening. The night of the event he was on time, professional and the act was extremely hilarious. He was appropriate for our work Christmas party as the age of attendance was 22-90. We would highly recommend him! Thank you for mentioning Sarah in your review. As my manager she is the unsung hero of our operation and is our first point of contact with clients. She is a true believer in customer service and is always on the ball. And thank you for booking me to entertain your people. They were a pleasure to spend time with. The scuttlebutt around the office before the show was strong skepticism about a magician/comic for a bunch of adults. It only took a few minutes for that concern to fade away. 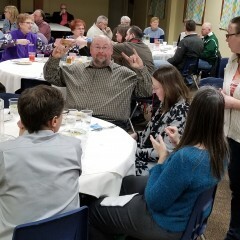 Keith had 50 of our staff right after lunch roaring in laughter and enjoying themselves fully. Even the impossible to please thought it was great. Thanks! Keith made me look like the party planner extraordinaire for my wife's birthday party. Everyone truly enjoyed his blend of humor with magic. I would absolutely recommend Keith to anyone. Thanks Allan. It was a pleasure to entertain your family and friends, what a great group of people. And the look on your wife face at the end was a picture! Keith did an amazing job to impress the crowd. Everyone was so surprised and had a great time watching him. I would HIGHLY recommend Keith for any event you may have. Keith did a fantastic job at our Valentine Event. The crowd loved him and I would recommend him for anyone's event. Thanks Kieth! While I was not able to attend our event and had planned it, I received excellent feedback from the entire group. A group of retired and current employees from all generations and Mr. Fields entertained every person!!! We also were not versed in planning appropriately for the layout/view and Mr. Fields mentioned this upon his early arrival and we were able to modify it to suit our audience better. I highly recommend Mr. Fields to anyone for any event! Thank you Michelle it was a great fun show and I am sorry that you ended up missing it. I always try to arrive in good time to sort out any problems and we could have had a big one at your event! Half the audience couldn't see the stage! As I always arrive early we had time to do some last minute rearranging and the result was, well you said it, 'every person was entertained' and that is always my aim. Thank you for the review. Keith was highly entertainging and great to work with. He was flexible and timly. Thanks! 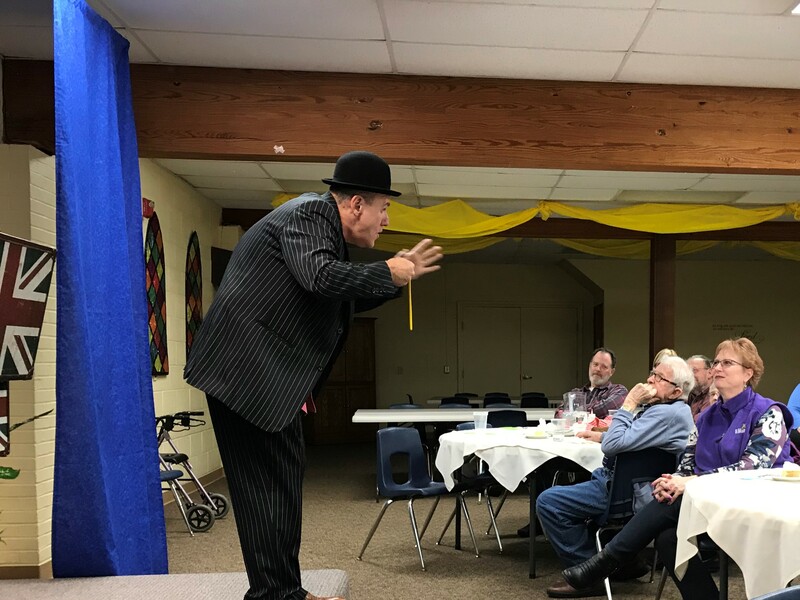 While looking for entertainment for our Christmas party, Keith Fields contacted us about performing. Keith was so good and so funny, we will most definitely have a tough time topping this years party!! Would most definitely recommend him for any party or event! What a wonderful man and entertainer!! Keith was great and very entertaining. By far our best party entertainment yet. All the employees enjoyed him and still talk about his routine. You will not be disappointed. Thank you for being such a great audience. I think I enjoyed the show as much as you did and it was a pleasure to entertain you all. That was the first time I have ever done a show in a zoo - a wonderful and interesting venue! We are so pleased with Keith and his talent! He has performed for our client dinners 3 times and he always brings his A game. Keith is great with the audience. 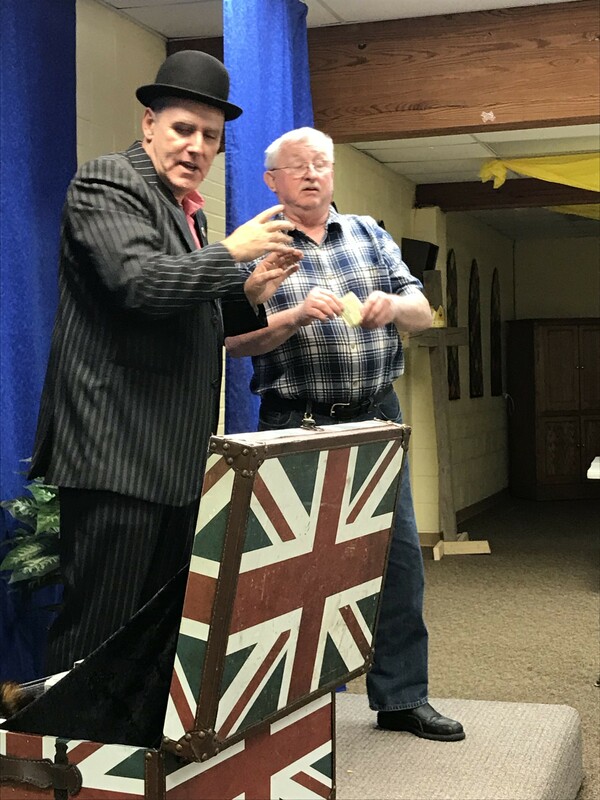 If you like amazing magic, laughing till you cry, and a well polished performance, then Keith is the entertainer for you! We had a great time. Lots of positive feedback from the guests. I would definitely recommend Keith for your event. Keith Fields performed at our transit conference and provided an outstanding performance. He was funny, witty, rolled with the punches and amazed everyone with his magic. He definitely made the conference great. At Larson Middle School in Troy, Michigan, we have a school wide character development campaign called Larson STRONG. Each letter has a strong message and Keith delivered an awesome show relating to each letter using magic! He performed 3 assemblies- one for each grade level. The kids were engaged, entertained and embraced each letter of his STRONG message. Looking forward to having him back this year promoting some different character strengths. Stand Up, Trustworthy, Resilience, Opportunities, Net-iquette, Gratitude! Great show- very professional performer! Keith was very funny and yet not offensive at all! We hired him for our catholic school fundraiser night and could not have been more pleased. He involved the audience and keep everyone laughing! It was a memorable night of fun- well worth his fee. WoW! What a great performance! Our company has hosted a client appreciation dinner for the past 14 years. Typical attendance is around 200. About a third arrive early, eat dinner and leave early, before the entertainment begins. This year was a completely different story. Not one person left before, or during Keith's performance. 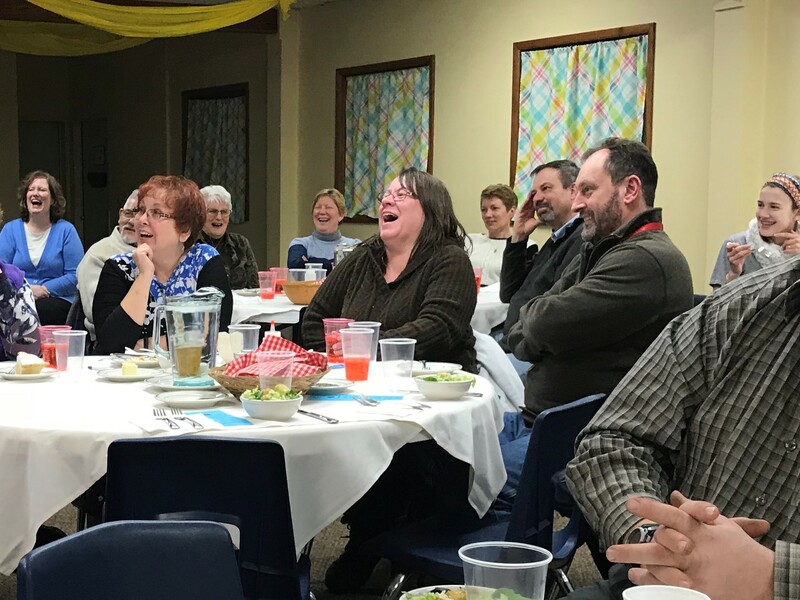 Laughter rang out among the delighted audience for the entire show. Keith was great with funny little comments that pertained to that particular moment, making the show very personal along with being very polished and professional. Afterwards, we received a lot of comments about this being the best dinner yet. We all knew it was because of Keith and his ability to transport us to a delightful state of pure joy. The following week, our clients were still calling in to thank us for the wonderful evening. Thank you Keith for sharing your talent with us, we thoroughly enjoyed every moment! Keith was the entertainment for an event that our organization hosts annually. Those in attendance included many donors of the club and other community members. We also had a number of club members under the age of 18 at the event. Keith's performance was entertaining and appropriate for all those in attendance. He had volunteers of all ages participate in the show, including the mayor of our city. Keith had a low-maintenance set up and was very easy to work with. He was conscious of the length of his performance and fit in very well with our program. We are grateful that he was able to come be a part of our event. we hired Keith to entertain our group of about 50 restaurant employees at our annual team meeting. 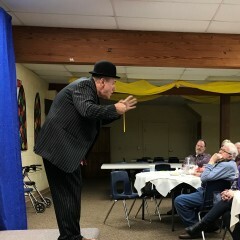 His performance was very funny, with great variety, and he provided entertainment that perfectly matched the age groups represented at the meeting (mostly 20-30 yrs old). VERY SATISFIED WITH HIS PERFORMANCE!!! Keith Fields did a nice job of entertaining our middle school students while sending important character education messages. His program kept their attention and I have no doubt they enjoyed the assembly. "One of our best asemblies"
Keith did an assembly for our high school and did a fantastic job for us. His fast-paced and professional show connected very well with the kids, and his comedy and personality had their attention the entire time. A high school audience is a tough crowd, but the kids talked about Keith long after the show and I would not hesitate to bring him back again. Great talent, tailored to his audience. I've had the opportunity to see Keith Fields perform in two, adult venues, and one family venue. While he is never crude or inappropriate, he was able to read his audience and tailor his material appropriately. He was not just a really good magician, he was hilarious as well. I'd go see him again, anytime! 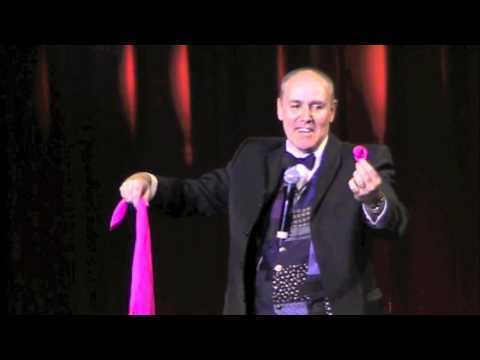 Keith Fields appeared last week in our VEGAS MAGIC THEATRE Shows at the Gold Coast Hotel & Casino in Las Vegas and proved just what an experienced professional he is. A good magician with terrific comedy timing and a very likeable character, Keith had the audience in the palm of his hands from the moment he walked out on stage. He did a great job and I'd book him again without hesitation. Clean comedy with lashings of laughter... and that is guaranteed! Keith is an outstanding multi-award winning entertainer with 30 years of experience working in just about every conceivable venue. He has performed in London's West End, New York's Broadway and the Las Vegas Strip. 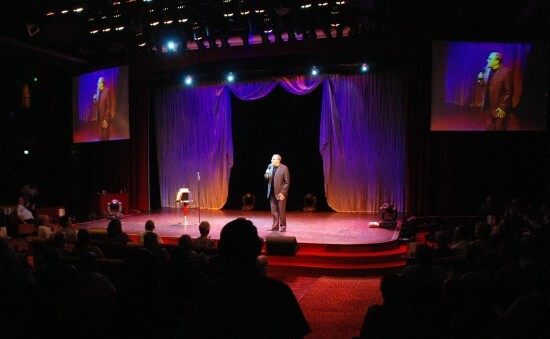 He is a regular headline act on cruise ships working for Celebrity, Princess, Dysney Cruise Lines, Crystal, and many more. Originally from the UK he now resides in the mid west where he lives with his wife and 2 teenage children. 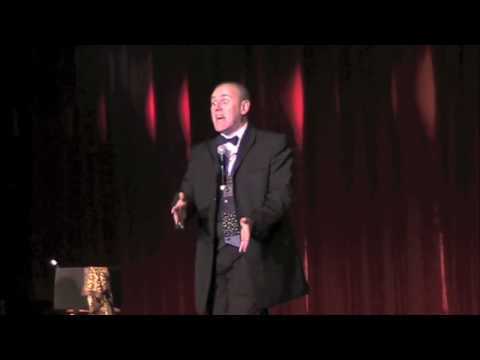 He has been described as 'Delightfully Wacky and bordering on the Manic' by the Edinburgh evening news and 'different dramatic and very funny' by the Magic Circle, the UK's most elite magic club who have recently awarded him membership of the inner magic circle, their highest honor also held by David Copperfield, Harry Blackstone Jnr. Keith is one of the most experienced and professional acts around who is used to working for clients of all ages and backgrounds. For more information and a free consultation to see if we would be a good fit for your event please call or email today. I need to be seen and heard to do a great show. A microphone that works helps, a spot light is nice, a well lit stage is perfect. If you haven't got what we need then I can usually arrange someone to provide it. I can pretty much work anywhere from a large theatre, a hotel ballroom, a conference room or a private house. Over the years I have worked in the 5* luxury of the worlds greatest hotels and cruise ships and entertained our armed forces in war zones where we had to keep the noise down! Keith Fields He is Keith Fields! My biggest influence is the late great Tommy Cooper - the funniest man to walk the earth. He lived his life making people laugh and died quite literally doing what he loved - on a live variety show on television. If I manage to get half the laughs that Tommy did then I will be a happy man!